Comparable to original equipment, tubing is double wall copperized steel with galvanized zinc for excellent rust protection. The same galvanized zinc tubing but with the added protection of gloss black or silver powdercoating for longevity and a professional appearance. If you need tools for your brake line, JEGS offers kits that include the tubing and fittings plus a tubing cutter, bender, and flare tool. 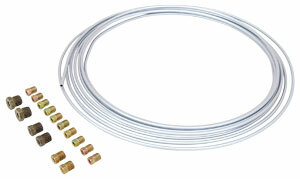 * Kits include 25' of tubing and assorted standard inverted flare fittings for domestic vehicle applications. 63030 is rated 4.2 out of 5 by 6. Rated 5 out of 5 by Todd S from Easy to work with Used this line to finish out my impala project. It bent easily and was no problem to flair. Rated 5 out of 5 by Wayne92 from Perfect kit I bought this kit and was able to plumb an entire Monte Carlo with it. Line bends easy by hand, so no tubing bender needed. Rated 3 out of 5 by Caddi Man from not copperized Regular steel line, will not bend by hand. Fittings OK. Rated 3 out of 5 by mauler from Quality parts kerrap tools The tubing and fittings were great quality. The tools on the other hand were low quality. the double flare tool failed after 3 flares so that was nice. JEGS 28073 - Racing Brake Fluid 579 degree 12 oz.